Click on the time for the current weather conditions and 6-day forecast! Maui was voted "Best Island in the World" in the 17th annual CONDE NAST TRAVELER Readers' Choice Awards Poll for the eleventh consecutive year. Millions of years ago Maui emerged from the sea when two volcanic eruptions formed separate islands. These islands were joined when an enormous lava flow from Haleakala (larger volcano on the right) filled the gap between the two volcanoes. The volcanoes are now dormant but they left Maui with rich volcanic soil which became ideal for growing sugar cane and pineapple. Today the landscape of Maui has something for everyone ranging from gorgeous palm lined beaches to the 10,000 plus foot summit of Haleakala with its massive crater located in the nearly 30,000 acre Haleakala National Park. In between you will find fascinating forests, spectacular waterfalls and craggy sea cliffs as you drive and hike around the island. Maui County is designated as a National Marine Sanctuary, because it is home to endangered species such as the humpback whale and green sea turtle. 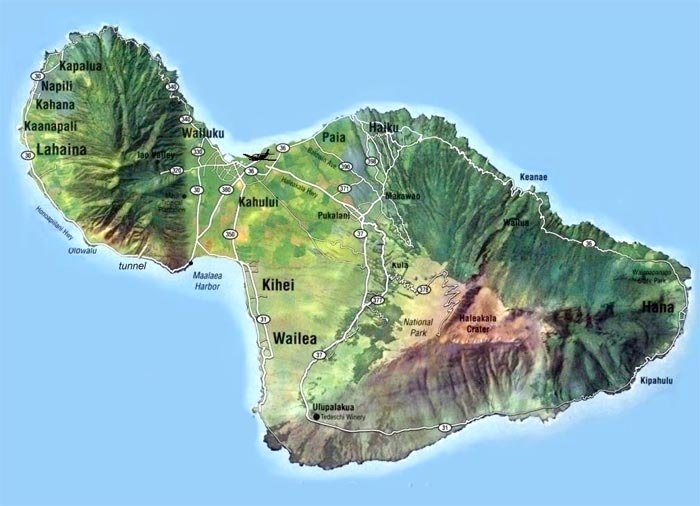 The County of Maui is actually comprised of Maui proper plus three smaller islands. Three smaller islands are visible from the western side of Maui proper and from north to south the islands are Lanai, Molokai, and Kahoolawe . Lanai and Molokai each have towns and are accessible by ferry or small aircraft and make a lovely back drop for impressive sunrises and breathtaking sunsets from your private Lokelani balcony. Lokelani Condominium is located in the center of Western coast of Maui in Honokawai. However, because the island is small our mailing address is Lahaina. 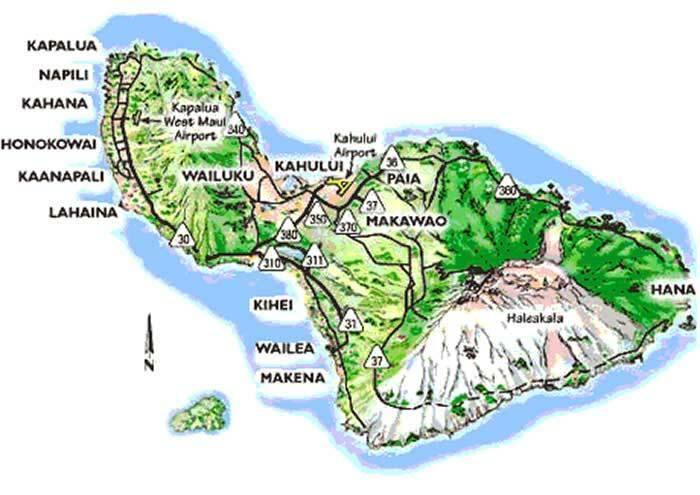 Geographically West Maui is comprised of Kapalua, Napili, Kahana, Honokowai, Kaanapali and Lahaina (see left hand side of the island drawing below). Lahaina is the historical center of Maui , and started its life as a major whaling port. Often called the "jewel in the crown of Maui," Lahaina is a destination that is experienced by more than two million people, or 83% of all Maui visitors, annually. Lahaina town is the second most visited spot on Maui after the beaches. Lots of boat tours, diving expeditions, snorkeling trips, dinner cruises and sports fishing originate from the bustling port. Lahaina has something for everyone including theater stage productions, a wide range of restaurants, luaus, historic sites, a magic theater, shopping and art galleries. 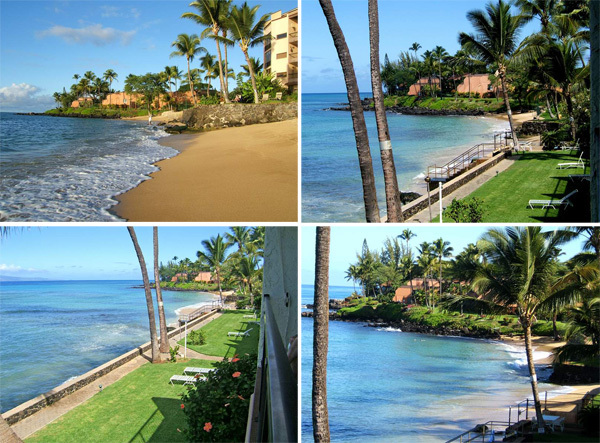 Lokelani Condominium is conveniently located between Kapalua to the North and Lahaina to the South and is only 0.8 miles (2 minutes) from the Kapalua West Maui Airport (JHM) or 30 miles (45 minutes) from the Kahului Airport (OGG). The main Maui airport is Kahului (OGG) and offers many direct flights from the mainland. By flying into this airport you will have lots of choices for purchasing food and supplies including a Costco less than a mile from the airport and on your way to Lokelani Condominium. Also the drive which will take you about 45 minutes is quite beautiful and interesting ranging from sugar cane fields to the impressive western Maui coastline. If you don't mind Turbo-prop 32 seat airplanes and can connect thru Honolulu in time to make the last flight to Kapalua airport (JHM) at 4:50 pm, then you should do this. 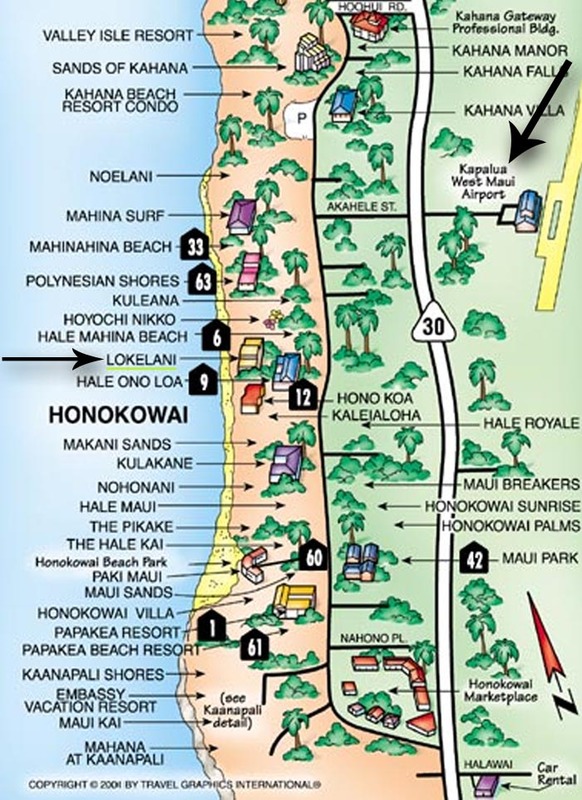 You will be about only 0.8 miles from Lokelani Condominium. You will have to make a call for the shuttle to take you to the Rental Car lot, but it is less stressful in many ways. The airport code for Kapalua is JHM and Island Air is connecting airline. If you can't arrive at Kapalua (JHM) then maybe you can arrange to fly out of this airport. Click here for directions to either airport. Maui is a tropical island with a mild year-round climate tempered by the Pacific Ocean . 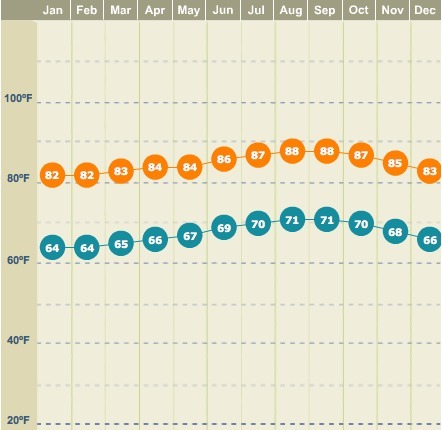 The average afternoon winter temperature at sea level is approximately 75°F/23°C during the coldest months of December and January. 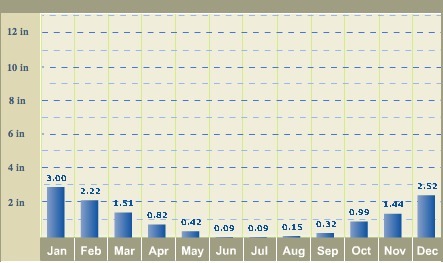 The warmest months are August and September with average temperature in the mid 80s°F. However, like most tropical islands various microclimates exist which means you have to come prepared with swim suits and hot-weather clothing for the beaches, a lightweight windbreaker for the occasional shower at higher elevations, and more serious protection if you plan to go the summit in Haleakala National Park. The dress on Maui is typically quite casual. Sports clothing or beachwear is appropriate for nearly all day time activities. However if plan to do anything at higher elevations, like enjoying one bicycle runs down Haleakala or hiking the crater, use layers and be prepared for rain or drizzle. For evening casual tropical attire will be fine for all but the fanciest nightspots. Please first look at our availability calendar for the specific dates you are considering. Unfortunately, many popular times are booked 1 year in advance! The availability calendar is kept current; however it is not real time so we apologize in advance if we do not have availability for your specific dates when you call. The current rate is $269/night based on a 7 night minimum stay for our 1,117 square foot (very large for ocean front condo standards) 2 Bedroom 1.5 bath condominium. If you are unable to stay 7 or more nights then there is and $85 short stay fee. A discount is also offered for stays of 21 nights or greater. Please mention that you saw Lokelani B-204 on our website as this makes a difference in the booking. Reservations or inquiries can be made by calling toll free at 1-800-367-2976 or emailing LokelaniHI@aol.com . Remember to mention that you saw Lokelani B-204 on our website. If our unit is not available they will be able to help you find another Lokelani unit. Gazebo: Best breakfast on the island with an incredible oceanfront view. Just 2 minutes North of Lokelani B-204. Located at the Napili Shores Condo Complex at 5315 Lower Honoapiilani Road next to the pool. Arrive early (20-30 minutes) before they open to enjoy the free coffee alfresco so you can be in the first seating. Sea House Restaurant: 2nd best place to watch the sunset set (1st is from Lokelani B-204's main Lanai!) Great for place for lunch or a tropical drink while watching the crowds enjoy beautiful Napili Beach . Located in the Napili Kai Beach Repost at 5900 Lower Honoapiilani Road . Okazuya Takeout: Folks stand in line for the made to order food and after you have tried their Mahi Mahi Lemon Caper Sautee you will understand why. Order via phone, wait 10 minutes and drive South just a couple blocks to 3600-D Lower Honoapiilani Road to pick-up your order! Ringed by 120 miles of coastline, Maui boasts over 30 miles of beaches. Many are easily accessible beach parks with lifeguards, picnic facilities and restrooms. Others are undeveloped, pristine, "secret spots" off the beaten path. All of Maui 's beaches feature sparkling crystal-blue waters, tropical tradewinds, and blue skies that go on forever. Several of Maui 's beaches are known worldwide for unrivaled surfing and windsurfing conditions. Others are well suited for the beginning snorkelers, beachcombers, and families with children. All beaches in Maui are public and each has access from the road for all visitors. The beach directly in front of Lokelani Condominium is always present from the steps and to the right offering a terrific spot protected swimming and snorkeling. However, the amount of beach in front of the rest of the complex varies from very little to a full length sandy beach depending on the winds. Black Rock Beach is excellent for beginning snorkelers and swimmers to experienced SCUBA divers. Coral and tropical fish are abundant. This is the northernmost section of Kaanapali Beach . A beach walk winds through Kaanapali with easy access to beachfront hotels, shopping and restaurants. This classic west Maui beach was named " America 's Best Beach " in 2006. A long-time favorite for body and board surfing, this public park al so features good swimming. Facilities include picnic tables and restrooms. Lifeguards on duty. Known to Maui veterans as Old Fleming Beach, Kapalua is the first of Maui's beaches, and the first beach ever, to be named “"America's Best Beach" (1991).” A truly beautiful tropical beach which offers swimming, snorkeling and SCUBA diving. Another local favorite with a unique natural pool surrounded by a lava rock wall. Excellent for small children; picnic tables and restrooms. This beach provides swimming, picnic tables, restrooms, grills and a grassy park. Waves are excellent for beginning and intermediate surfers. 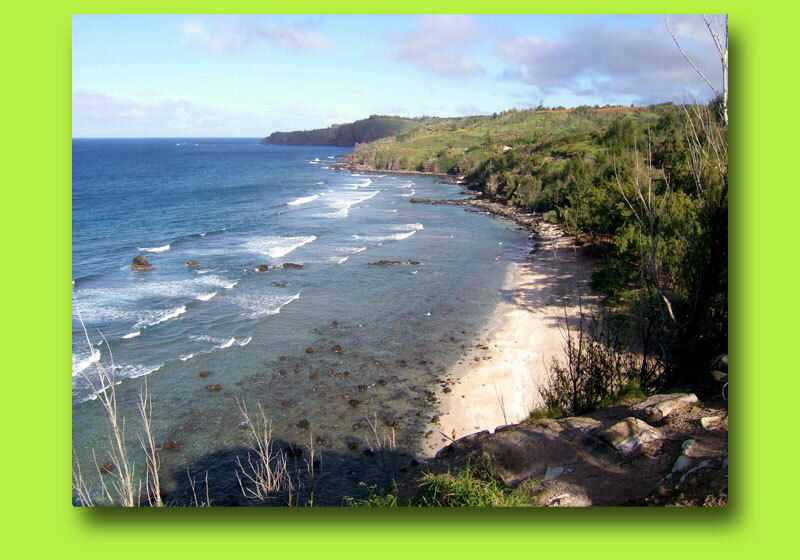 Another local favorite with calm water conditions for swimming, snorkeling and boogie boarding. Restrooms, picnic tables and grills are available. With over 20 golf courses Maui can clearly lay claim to be one of the world's premier golf destinations. Maui has several ranked at or near the top worldwide in many categories. Although Maui hosts several well-known professional tournaments tee times are rarely hard to come by. If your game is in need of a brush-up Maui 's teaching professionals are ready and able to utilize the newest in high-tech instructional tools and methods on your behalf. Whether you're a life-long addict, or just learning one of the world's favorite pastimes, you'll find golf on Maui the sporting experience of a lifetime. Built of coral and stone, Dr. Dwight Baldwin, an early missionary to Lahaina, lived in this home with his family from the 1835 to 1868. The Baldwins had a fine garden and introduced plants such as the Kukui, kou, banana, guava, figs and grapes. The house was restored by the Lahaina Restoration Society with period furnishings to give visitors a sense of missionary family life of the time. Located at 696 Front Street (at Dickenson Street ) , Lahaina: (808) 661-3262. Cost: $3. Daily 10-4. Haleakala Crater is the main attraction of this large national park with hiking and camping permitted year round. The 27 miles of trails in the Haleakala wilderness cover a land of great contrasts, not only of terrain, but also of topography. Weather can change quickly so you may be exposed to intense sunlight, and then be suddenly surrounded in thick clouds and heavy rain. Haleakala rises to 10,023 feet, with a decent to the valley floor of 1,400 feet to 3,000 feet. Care must be taken to allow for unexpected weather changes, but poor weather, rarely stays long. Beautiful, clear days are more common. The Haleakala Visitor Center (http://www.haleakala.national-park.com/visit.htm ) offers information and exhibits on wildlife and geology, and Puu Ulaula Overlook at the summit affords breathtaking views of the crater which are most often enjoyed at either sunrise or sunset. Haleakala Crater Road , Makawao, Telephone: (808) 572-4400. Cost: $10 per car for a 7 day pass. For a glimpse of old Hawaii , visit the quaint town of Hana on the rainy side of the island. The journey to this small town should be enjoyed via the Hana Highway or alternately known as the Road to Hana and often referred to as “the most beautiful drive in America ”. The drive offers spectacular ocean views, gorgeous waterfall, 617 curves and 56 one-lane bridges. Once in Hana stop at t he Hana Cultural Center Museum ( 4974 Uakea Road , overlooking Hana Bay ) to see displays and information about the area. For a splurge, treat yourself to lunch at the Hotel Hana Maui or take a picnic lunch to the beach at Hana Bay . Hana Highway , Mile Marker 35. The Maui Ocean Center is the largest aquarium in Hawaii and offers more than 60 self-paced, interactive exhibits that emulate the habitats of ocean animals including the Underwater Journey where you can experience a tunnel that offers a 240-degree view of marine life in a 750,000-gallon open ocean tank. Plenty of free parking and places to eat as well as a variety of retail stores for shopping are nearby. Honoapiilani Highway . (Highway 30), Maalaea Harbor . Maalaea: (808) 270-7000. Cost: $18.50. Paia once was a booming sugar cane plantation town still has many of its old plantation style wooden buildings in tact today. This quaint little beach town offers something for everyone with its 39 shops including fine specialty shops, boutiques, surf shops, antique stores, and even an old fashioned tattoo parlor. The town can cater to every taste with 14 restaurants including bakeries, coffee shops, delis, plus Pacific Rim, Continental, Mexican, Crepes, Indian Curries, Mediterranean and Vegetarian cuisine. Paia is just 4 miles from the Kahului Airport at Highways 390 and 36.